PDB rendering based on 1st0. 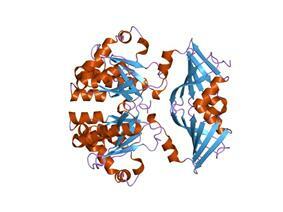 Scavenger mRNA-decapping enzyme DcpS is a protein that in humans is encoded by the DCPS gene. The scavenger mRNA decapping enzymes include Dcp2 and DcpS. 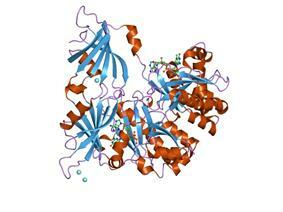 DcpS is a scavenger pyrophosphatase that hydrolyses the residual cap structure following 3' to 5' mRNA degradation. DcpS uses cap dinucleotides or capped oligonucleotides as substrates to release m(7)GMP (N7-methyl GMP), while Dcp2 uses capped mRNA as a substrate in order to hydrolyse the cap to release m(7)GDP (N7-methyl GDP). The association of DcpS with 3' to 5' exonuclease exosome components suggests that these two activities are linked and there is a coupled exonucleolytic decay-dependent decapping pathway. The family contains a histidine triad (HIT) sequence in its C-terminal domain, with three histidines separated by hydrophobic residues. The central histidine within the DcpS HIT motif is critical for decapping activity and defines the HIT motif as a new mRNA decapping domain, making DcpS the first member of the HIT family of proteins with a defined biological function. ^ Liu H, Rodgers ND, Jiao X, Kiledjian M (Aug 2002). "The scavenger mRNA decapping enzyme DcpS is a member of the HIT family of pyrophosphatases". EMBO J 21 (17): 4699–4708. ^ van Dijk E, Le Hir H, Seraphin B (Oct 2003). "DcpS can act in the 5'-3' mRNA decay pathway in addition to the 3'-5' pathway". Proc Natl Acad Sci U S A 100 (21): 12081–12086. ^ "Entrez Gene: DCPS decapping enzyme, scavenger". ^ Liu H, Kiledjian M (February 2006). "Decapping the message: a beginning or an end". Biochem. Soc. Trans. 34 (Pt 1): 35–8. ^ Han GW, Schwarzenbacher R, McMullan D, Abdubek P, Ambing E, Axelrod H, Biorac T, Canaves JM, Chiu HJ, Dai X, Deacon AM, DiDonato M, Elsliger MA, Godzik A, Grittini C, Grzechnik SK, Hale J, Hampton E, Haugen J, Hornsby M, Jaroszewski L, Klock HE, Koesema E, Kreusch A, Kuhn P, Lesley SA, McPhillips TM, Miller MD, Moy K, Nigoghossian E, Paulsen J, Quijano K, Reyes R, Spraggon G, Stevens RC, van den Bedem H, Velasquez J, Vincent J, White A, Wolf G, Xu Q, Hodgson KO, Wooley J, Wilson IA (September 2005). "Crystal structure of an Apo mRNA decapping enzyme (DcpS) from Mouse at 1.83 A resolution". Proteins 60 (4): 797–802. Maruyama K, Sugano S (1994). "Oligo-capping: a simple method to replace the cap structure of eukaryotic mRNAs with oligoribonucleotides". Gene 138 (1–2): 171–174. Suzuki Y, Yoshitomo-Nakagawa K, Maruyama K et al. (1997). "Construction and characterization of a full length-enriched and a 5'-end-enriched cDNA library". Gene 200 (1–2): 149–156. Zhang QH, Ye M, Wu XY et al. (2001). "Cloning and functional analysis of cDNAs with open reading frames for 300 previously undefined genes expressed in CD34+ hematopoietic stem/progenitor cells". Genome Res. 10 (10): 1546–1560. Wang Z, Kiledjian M (2002). "Functional link between the mammalian exosome and mRNA decapping". Cell 107 (6): 751–762. Strausberg RL, Feingold EA, Grouse LH et al. (2003). "Generation and initial analysis of more than 15,000 full-length human and mouse cDNA sequences". Proc. Natl. Acad. Sci. U.S.A. 99 (26): 16899–16903. Kwasnicka DA, Krakowiak A, Thacker C et al. (2003). "Coordinate expression of NADPH-dependent flavin reductase, Fre-1, and Hint-related 7meGMP-directed hydrolase, DCS-1". J. Biol. Chem. 278 (40): 39051–39058. Ota T, Suzuki Y, Nishikawa T et al. (2004). "Complete sequencing and characterization of 21,243 full-length human cDNAs". Nat. Genet. 36 (1): 40–45. Gu M, Fabrega C, Liu SW et al. (2004). "Insights into the structure, mechanism, and regulation of scavenger mRNA decapping activity". Mol. Cell 14 (1): 67–80. Liu SW, Jiao X, Liu H et al. (2004). "Functional analysis of mRNA scavenger decapping enzymes". RNA 10 (9): 1412–1422. Gerhard DS, Wagner L, Feingold EA et al. (2004). "The status, quality, and expansion of the NIH full-length cDNA project: the Mammalian Gene Collection (MGC)". Genome Res. 14 (10B): 2121–2127. Malys N, Carroll K, Miyan J, Tollervey D, McCarthy JE (2004). "The 'scavenger' m7GpppX pyrophosphatase activity of Dcs1 modulates nutrient-induced responses in yeast". Nucleic Acids Res. 32 (12): 3590–3600. Chen N, Walsh MA, Liu Y et al. (2005). "Crystal structures of human DcpS in ligand-free and m7GDP-bound forms suggest a dynamic mechanism for scavenger mRNA decapping". J. Mol. Biol. 347 (4): 707–718. Kwaśnicka-Crawford DA, Vincent SR (2005). "Role of a novel dual flavin reductase (NR1) and an associated histidine triad protein (DCS-1) in menadione-induced cytotoxicity". Biochem. Biophys. Res. Commun. 336 (2): 565–571. Malys N, McCarthy JEG (2006). "Dcs2, a novel stress-induced modulator of m7GpppX pyrophosphatase activity that locates to P bodies". J. Mol. Biol. 363 (2): 370–382.